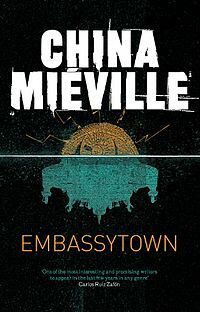 Embassytown is science fiction novel by China Mieville. It is written from the perspective of Avice who was born and raised in the titular Embassytown. A town that exists to maintain relations between humanity and a unique species called the Ariekei. The Ariekei have no interest in spaceflight and so can only be found on this one planet but are significantly more advanced than humanity in terms of biotechnology. Their cities and most of their equipment are strange biorigged devices even the very buildings themselves are living organisms. What really defines the Ariekei however is their language. They evolved with two mouths, making their language impossible for a human to speak independently, their speech is in many ways mixed up in their thoughts. They require another united mind to speak the words for them to register as language, this prevents the use of speech synthesis and language translation software. Whilst human can learn to understand the Language, they cannot speak it save in remarkably well synced pairs. The Ambassadors in Embassy town are specifically bred and raised as clonepairs for this purpose. The Language is very literal and inflexible, at the beginning of the book Avice becomes part of it, she is a Simile, the girl who ate what was given to her, allowing the Ariekei to express ideas that were previously more difficult. I found the events of the book particularly interesting as they related to the Language, what makes it special and the moral choices the characters are confronted with. Is it right to teach a species incapable of lying how to do so? How does that then change a society and its language? This book hooked me in as it started exploring more of what the Ariekei were and what their language actually meant. I enjoyed it a lot more than I initially expected to. I have chosen not to read A Dance With Dragons, the other novel up for a 2012 Hugo, it is the fifth book in the Game of Throne series and I have not read any of the other novels, I tried reading some of it but I was far too lost for my reading to be fair to it. Instead I have moved on to reading through the Hugo nominated novellas.